After a delay, Epic Games released its latest Fortnite patch today, and although it’s not the most action-packed update, it’s got some great quality of life improvements. I’m excited about the game’s new auto-pickup option for weapons and consumables because, when I land in a new area and encounter someone who already has a gun, arming myself can be just a little faster. Thankfully, the option only slots items in empty slots instead of replacing items. Epic also made footstep audio cues clearer, so players can better discern whether enemies are above or below them. 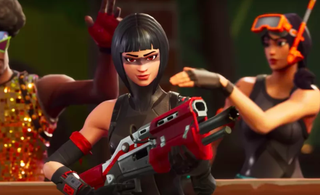 Players’ situational awareness will also improve now that wood surfaces creek, stone surfaces crunch and metal surfaces rattle, according to Fortnite’s new patch notes. Server performance got a boost, too, so players’ shooting and movement should be more “responsive,” says Epic. With this update, players have an easier time dancing, chewing popcorn and doing whatever other emotes in the game’s lobby. On console, players just have to click the right analog stick. An “emote” option is now available on the bottom of the lobby screen. The update added just a few new items, including epic and legendary burst assault rifles and apples, which players can forage and consume to gain five health. You can read the full patch notes here.